Welcome to the future of education. A smart, digital-first workplace that empowers your staff to deliver education in innovative new ways, increase efficiency and transform the work/life balance. 35% of schools have already implemented cloud technology. 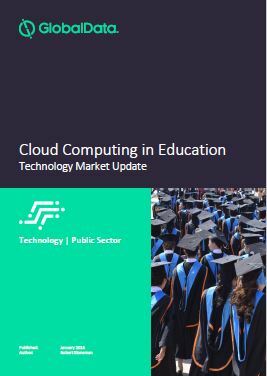 It’s all thanks to the cloud: simple, shared, on-demand computing resources that are driving digital transformation across schools, further education and high education. A ‘cloud-first’ strategy can help you improve service delivery, increase collaboration and deliver agility, while simultaneously maximising flexibility at lower cost. Secure print and document management systems in the cloud: Take a look at our print management video to see how you can ensure access control, job tracking and print security within a secure cloud platform. Konica Minolta can lead you to a cloud-first education future. Our Managed Cloud Hosting Services blend collaboration, security and efficiency with proven education sector expertise. So you can transform faster and pivot to delivering the education of the future. Konica Minolta’s inclusion on National Public Sector Frameworks such as G-Cloud 10 and CBC Managed Services, enables UK education providers to confidently choose Konica Minolta cloud computing services for their infrastructure, platform, software and specialist cloud services. Now is the time to trust the UK Government-accredited Konica Minolta Managed Cloud Hosting services to deliver your digital transformation. Looking to reduce IT costs? Increase IT security? Accelerate education services delivery? Improve disaster recovery? 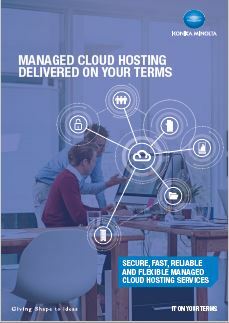 Our portfolio of fast, secure, reliable and flexible Managed cloud hosting services can take you there. Delivered via our network of UK data centres, these transparently priced services can help you achieve a smarter education future. Our consultancy approach also ensures the services you receive are the best fit for your business and budget. Our education customers speak for themselves. 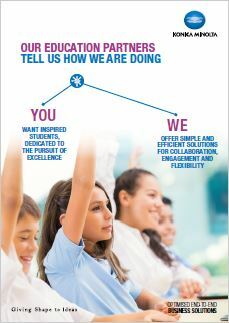 Read this report and discover how Konica Minolta is helping UK education authorities of all types to work smarter and more efficiently. In order to further explain the role that technology plays on the evolving work landscape, Konica Minolta have listed their top five drivers of workforce transformation in a recent blog post, “The future will be less about where we work, and more about what we do”. Artificial Intelligence and Robotics - According to the blog, the rise of AI and robotics shows no sign of slowing down, with “more and more of our work and personal tasks will be taken over in the next decade by cognitive systems, autonomous vehicles, bots and drones, as interconnectivity, data aggregation and analytics move forward”. Flatter Corporate Hierarchies - The evolution from the industrial age to digital means less layers in management hierarchy with a more diverse and flexible workforce – where employees can move along horizontal, vertical and diagonal paths. The ‘Corporate Lattice’ brings about more opportunities, multi-skilled and empowered employees. The ‘Gig’ Economy - Mobile working brings mobile workers. According to Konica Minolta, “the appetite of employers for mobility and flexibility, coupled with millennials’ thirst for more blended work and personal time is helping to drive a new kind of workforce”. Skilled freelancers can find their talents better matched to varied roles that further empowers the workforce. ‘Second Tier’ Cities - With remote working high on the agenda, employees don’t necessarily have to live and work in the main city hotspots, which also have the highest living costs. Some organisations and government departments are setting up satellite offices in ‘second tier’ cities, where it’s cheaper to live and do business but still attracting the same level of skilled workers. Being at Work Anywhere - The advent of technologies such as augmented reality and virtual reality, amongst others, have revolutionised how and where we work. The digital workplace becomes an extended workplace that is flexible and collaborative while remaining a ‘personal’ experience.